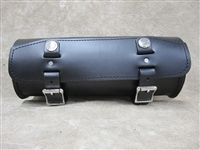 The 95X leather tool bag is an extra long round bag. 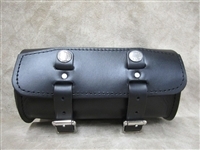 An extra 2″ was added to the length of our popular 95 leather tool bag for extra storage. 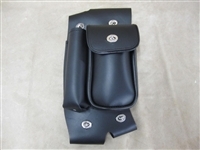 The bag opens and closes with quick release buckles. This leather tool bag is made from our 10 oz leather and won’t break or fall off your motorcycle forcing fellow riders to dodge the flying tools. It is designed for motorcycles with wide front ends and it attaches to the forks or the handle bars. All straps necessary for attachment are supplied with the bag. 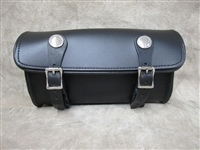 5"H x 14"L x 5"
The 95W leather tool bag is an extra wide round bag. 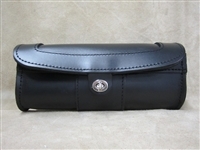 An extra 1 ½” was added to the width of our popular 95 leather tool bag for extra storage. 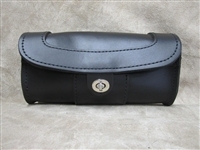 The bag opens and closes with quick release buckles. This leather tool bag is made from our 10 oz leather and won’t break or fall off your motorcycle forcing fellow riders to dodge the flying tools. It is designed for wide front ends with extended forks or ape hangers and it attaches to the forks or the handle bars. All straps are supplied with the bag. 6 ½” "H x 12""L x 6 ½”"